Honda's UK factory is exporting the new Civic hatchback to global markets. TOKYO - Honda will continue its operations in the UK despite the country's vote to quit the European Union, a top executive said. Honda Executive Vice President Seiji Kuraishi said the Japanese automaker has "no intention" of withdrawing from the UK where it is investing to make its sole factory in the country a global production hub. Kuraishi's comments came after Nissan said last week that it would build its next-generation Qashqai and X-Trail SUVs at its factory in Sunderland, England, after the British government told the automaker it was committed to ensuring tariff-free trade between the UK and EU. 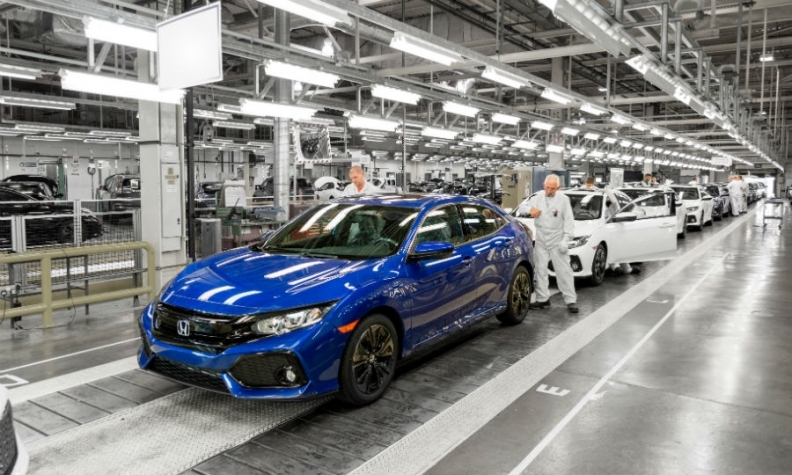 Honda is investing 200 million pounds in its 250,000-capacity UK factory in Swindon, England, to expand production of the five-door Civic hatchback, exporting the compact car to the U.S. and Japan, as well as EU markets. Honda will watch the development of the UK's negotiations to leave the EU, Kuraishi said. "We need to carefully watch currency exchange and sales trends. But we have no intention of withdraw from the UK and will continue doing business there." He said the role of the Swindon plant is to not just produce European models, but also to export to Japan and North America. Kuraishi said Honda cannot make any permanent decisions about future production in Swindon until the terms of Brexit are clearer. "We hope to keep the current production capacity," he said. Honda hasn't asked the government for help in offsetting the impact of Brexit. But Kuraishi said any support given to Nissan should apply to all automakers, echoing comments demands from rival car companies such as Ford Motor and Jaguar Land Rover for assurances that they won't be hurt by Brexit. Honda is among automakers that have raised new-car prices in the UK to recoup money lost after the pound's collapse against the euro following the Brexit vote in June. The aftermath of the Brexit referendum has not had much impact on Honda's UK sales. "We need to carefully watch currency exchange and sales trends," Kuraishi told reporters on Monday during Honda's quarterly earnings press conference.